Paparazzi takes Beyoncé's opponent's next hit. However, during that, Beyoncé was re-applying nail polish and looses 10 health. 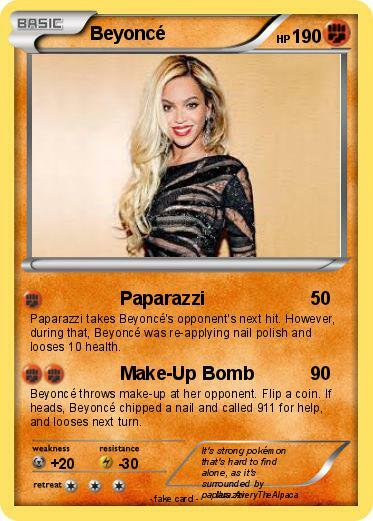 Beyoncé throws make-up at her opponent. Flip a coin. If heads, Beyoncé chipped a nail and called 911 for help, and looses next turn. Comments : It's strong pokémon that's hard to find alone, as it's surrounded by paparazzi.